As global peak oil passes in our lifetimes, estimates abound on exactly when. Unreliable claims of remaining reserves make predictions difficult. Optimistic calculations put the peak decades away, while the more pessimistic guesses place it in the past, back in 2005. A recent article in Nature promotes the earliest date. Professor Sir David King, director of the Smith School of Enterprise and the Environment, and James Murray of the School of Oceanography show that conventional oil production maxed out at around 75 million barrels per day six years ago. Since then, prices of sweet light crude leapt from $35 per barrel to over $100. This massive increase likely caused production in previously unprofitable areas, yet overall production has failed to increase. Still, six years of hovering does not tell us for certain that we are at peak, and we will ultimately not know if the peak has passed until it is well behind us. Ever increasing demand worsens the situation. In February 2010, the now-disbanded US Joint Forces Command warned that surplus oil production capacity could vanish in 2012, and the shortfall in output could reach 10 million barrels per day by 2015. (Though they stated that, in the short term, the primary limiting factor for oil production will be a shortage of drilling equipment and refineries instead of a lack of petroleum reserves.) The International Energy Agency’s 2011 World Energy Outlook states that oil consumption is already past 10 million barrels per day above our conventional oil production with unconventional oil making up some of the difference. It predicts a global demand of 99 million barrels per day by 2035, a value that seems impossible to support if the peak passes us now. The Joint Forces Command’s report was even more pessimistic, predicting a demand increase to 118 million barrels per day by the 2030s. Both organizations point to China as the main source of the increase. The problem isn’t best defined as the moment when desired consumption exceeds production. The trouble begins when people who once could afford their energy must learn to live with less. This could happen even ahead of the peak, when supply’s decelerating growth boosts the cost of oil high enough to price out some consumers. If the peak happens now, can we feel it? What is the world like just post-peak? Enthusiastic “doomers” might imagine an immediate and global economic collapse once demand exceeds supply, a scenario where many people must suddenly live without, leading to the level of chaos survivalists expect. But the experience may be much less dramatic. With oil production growth currently stagnating, we can find that post-peak life looks a lot like life now. In the post-peak world, oil prices fluctuate wildly, as they have for the past six years, destroying demand when prices are high and creating that bumpy plateau shown on page four, panel three. Alternative energy sources struggle to make up for the increasing shortfall of conventional oil. Government services degrade as economic growth stalls. Environmental damage surges where people turn to pollution heavy resources, where the desire for power defeats long-term survival concerns. In some countries, however, people get along relatively fine due to still plentiful local resources. The consequences of global peak oil are not evenly distributed, and in the absence of panicked reactions, the breakdown is slow. Brandt, Adam R. “Testing Hubbert.” Energy and Resources Group, University of California Berkeley, December 2006. Deffeyes, Kenneth S. When Oil Peaked. New York: Hill and Wang, 2010. Doel, Ronald. “Interview with Dr. M. King Hubbert.” American Institute of Physics, January 17, 1989. Gillis, Justin. “Oil Supply as a Strategic Risk.” The New York Times, January 25, 2012. Hubbert, M. King. “Nuclear Energy and the Fossil Fuels.” Shell Development Company. June 1956. King, David and James Murray. “Oil’s tipping point has passed.” Nature, January 2012, 433-5. United States Joint Forces Command. The Joint Operating Environment 2010. February 18, 2010. Hi, I totally dig your comics. 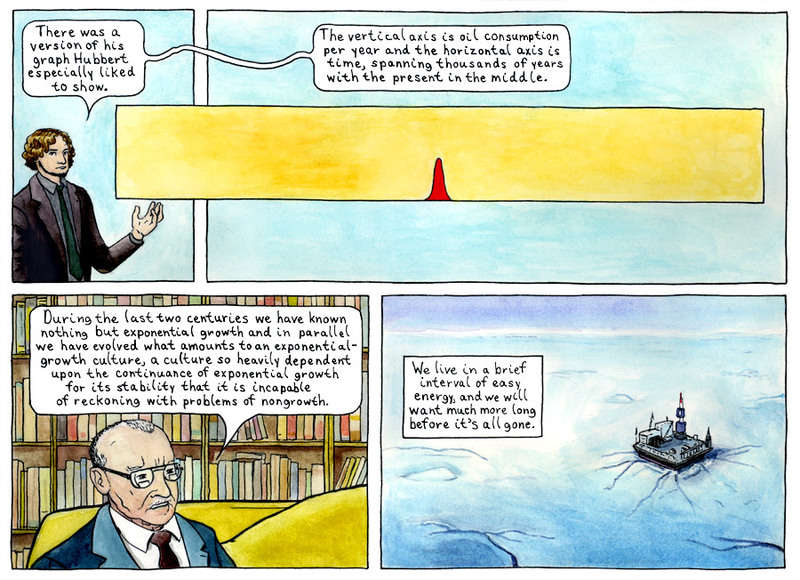 I’ve also touched on peak oil in my comics.